Service Excellence: Reading Customer Cues and Body Language – TAM Card® Nation in Vegas! A successful bartender or server is a keen and attentive observer. In addition to watching guests for signs of intoxication, one must also watch for cues and body language that indicate a guest would like to place a drink order or pay a bill. In a busy restaurant or crowded bar, it’s a challenge to provide excellent service to each and every one of your customers; the ability to watch for subtle hints and signals as you are rushing to clear tables or checking on other guests is crucial. So, do you know what to watch for? Recently, researchers at Bielefield University in Germany compiled video recordings of customers ordering drinks in order to program a robot to interpret the body language of those people who are ready to place an order (UPI). Findings from this study help to establish clues as to what customers are doing to signal bartenders that they need service. Researchers found that only about 7% of customers looked at their wallets to signal that they would like to place an order. Looking for a more obvious clue? Surprisingly, less than 4% customers gestured at the bartender. 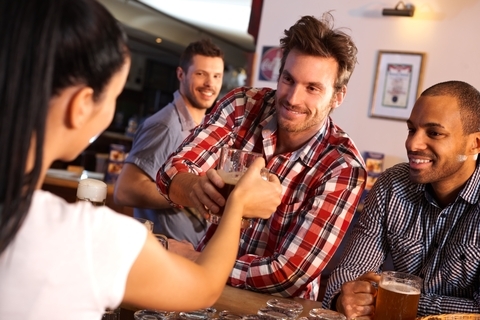 So, what should bartenders look for from customers who may be ready to order? In this case, 90% of customers took the initiative by positioning themselves right up against the bar counter, facing the counter or the bartender. What we can take away from this is that one should also look for customers who are subtly trying to catch your eye or gain your attention. While a robot bartender may sound like a fun gimmick for serving drinks, a responsible and diligent live bartender is necessary to read social situations and watch for signs of intoxication in customers. In addition to watching customers for cues that they would like to be served, watch them for cues that they should not be served. In order to learn the skills you need to serve effectively and responsibly, complete your Techniques of Alcohol Management® training and obtain a TAM® Card. Readers: What other advice would you give for reading cues and body language in customers? Pingback: What’s On Your Summer Entertainment List? Best Books and Movies for Bartenders | TAM® Nation in Vegas!